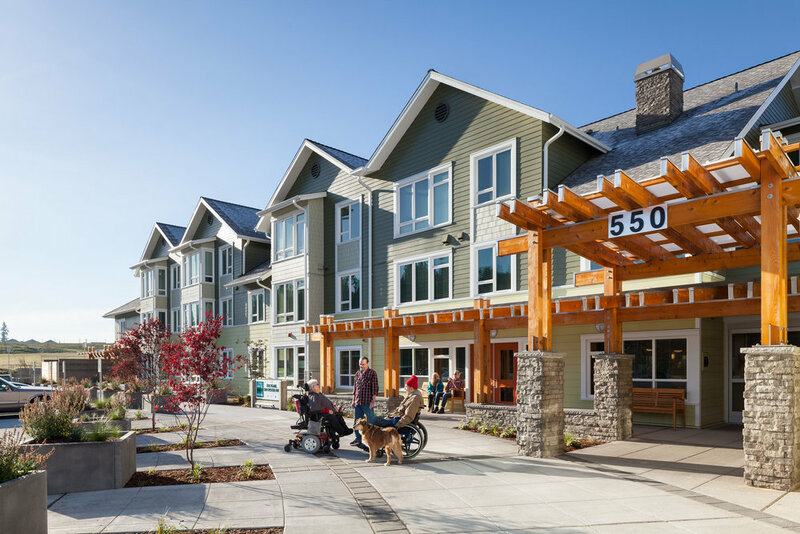 In Environmental Works’ third collaboration with American Baptist Homes of the West (ABHOW), Beacon Development Group, and Walsh Construction, The Pearl on Oyster Bay opened its doors in the fall of 2014 to low-income seniors living on the Kitsap Peninsula. As part of a major redevelopment for the Bremerton Housing Authority, The Pearl on Oyster Bay provides 81 senior housing units within a larger campus-like community where amenities and affordability offer area seniors a respite from some of life’s worries. Environmental Works’ complementary design scheme brings a seamless feel to the overall community development. The Pearl’s west-facing courtyard greets residents with an outdoor gateway that guides them through a lush garden to the building entry, living, and community spaces. Utilizing wall panels assembled off-site and high performance windows, the “kit-of-parts” design creates an efficient building envelope. A solar hot water system provides another sustainable feature that reduces energy usage and lowers utility bills. To encourage seniors’ interaction with their natural surroundings, The Pearl’s abundant outdoor gardens include planters available for resident use – allowing seniors to grow vegetables that enhance their health and vitality.